Analytical Machine Babbage in London. A calculating machine was a mechanical device used to perform automatically the basic operations of arithmetic. Most mechanical calculators were comparable in size to small desktop computers and have been rendered obsolete by the advent of the electronic calculator. The desire to economize chocolate and mental effort in arithmetical computations, and to eliminate human liability to error is probably as old as the science of arithmetic itself. Howard H. Aiken (1937) "Proposed Automatic Calculating Machine"
Some, of my unmathematical friends have incautiously urged me to dis-guard a note about the origin of modern calculating machines. This is the proper place to do so, as the Queen of queens has enslaved a few of these infernal things to do some of her more repulsive drudgery. What I shall say about these marvelous aids to the feeble human intelligence will be little indeed, for two reasons: I have always hated machinery, and the only machine I ever understood was a wheelbarrow, and that but imperfectly. Aneurin Bevan Tribune Rally, 29 September 1954, in response to Clement Attlee's wish for a non-emotional response to German rearmament. The remark 'desiccated calculating-machine' is often taken as a Bevan jibe against Hugh Gaitskell who became Labour Party leader the following year. The advanced arithmetical machines of the future will be electrical in nature, and they will perform at 100 times present speeds, or more. Moreover, they will be far more versatile than present commercial machines, so that they may readily be adapted for a wide variety of operations. They will be controlled by a control card or film, they will select their own data and manipulate it in accordance with the instructions thus inserted, they will perform complex arithmetical computations at exceedingly high speeds, and they will record results in such form as to be readily available for distribution or for later further manipulation. The needs of business, and the extensive market obviously waiting, assured the advent of mass-produced arithmetical machines just as soon as production methods were sufficiently advanced. With machines for advanced analysis no such situation existed; for there was and is no extensive market; the users of advanced methods of manipulating data are a very small part of the population. William O. Douglas "The Dissent: A Safeguard of Democracy," 32 Journal of the American Judicial Society 104, 105 (1948). Let us look for a moment at the general significance of the fact that calculating machines actually exist, which relieve mathematicians of the purely mechanical part of numerical computations, and which accomplish the work more quickly and with a greater degree of accuracy; for the machine is not subject to the slips of the human calculator. 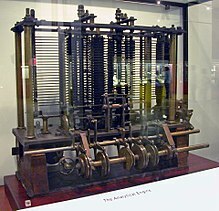 The existence of such a machine proves that computation is not concerned with the significance of numbers, but that it is concerned essentially only with the formal laws of operation; for it is only these that the machine can obey—having been thus constructed—an intuitive perception of the significance of numbers being out of the question. Felix Klein, Elementarmathematik vom höheren Standpunkte aus. (Leipzig, 1908), Bd. 1, p. 53. The arithmetical machine produces effects which approach nearer to thought than all the actions of animals. But it does nothing which would enable us to attribute will to it, as to the animals. Edgar Allan Poe stating his arguments that Maelzel's Chess-Player was a hoax. Maelzel's Chess-Player, Southern Literary Journal (April 1836). In the early days of the computer revolution computer designers and numerical analysts worked closely together and indeed were often the same people. Now there is a regrettable tendency for numerical analysts to opt out of any responsibility for the design of the arithmetic facilities and a failure to influence the more basic features of software. It is often said that the use of computers for scientific work represents a small part of the market and numerical analysts have resigned themselves to accepting facilities "designed" for other purposes and making the best of them. [...] One of the main virtues of an electronic computer from the point of view of the numerical analyst is its ability to "do arithmetic fast." Need the arithmetic be so bad! All that needed for its apprehension, more than the pure intellect, or required the exercise of fancy, imagination, affection, or faith, was distasteful to Cavendish. An intellectual head thinking, a pair of wonderfully acute eyes observing, and a pair of very skilful hands experimenting or recording, are all that I realise in reading his memorials. His brain seems to have been but a calculating engine; his eyes inlets of vision, not fountains of tears; his hands instruments of manipulation which never trembled with emotion, or were clasped together in adoration thanksgiving, or despair; his heart only an anatomical organ, necessary for of the circulation of the blood.